The outrigger canoe (Hawaiian: wa'a; Filipino and Indonesian: bangka; Maori: waka ama; Tahitian and Samoan:va'a) is a type of canoe featuring one or more lateral support floats known as outriggers, which are fastened to one or both sides of the main hull. 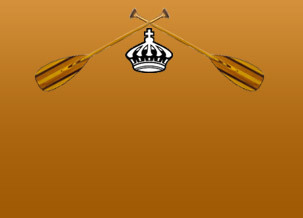 Smaller canoes often employ a single outrigger on the port side, while larger canoes may employ a single outrigger, double outrigger, or double hull configuration. 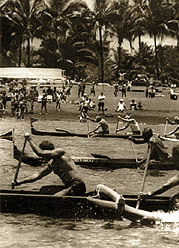 The sailing canoes are an important part of the Polynesian heritage and are raced and sailed here in Hawaii, Tahiti, Samoa and by the Maori of New Zealand. Ka`a kaua nalu Wave riding chariot, also known as "pirate ship"